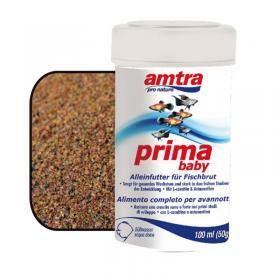 Amtra First Baby is a premium food for tropical fish, particularly suitable for the growth of the fry. The special composition ensures a high intake of proteins and which at the same time very attractive. It contains valuable raw materials and is enriched with L-Carnitine for healthy growth and astaxanthin for a shining coloration. Add more times per day such small quantities as to be consumed quickly. fish meal, fish products, wheat flour, baking powder, vegetable protein, shellfish, shrimp, plankton, spirulina, kelp, lecithin, vegetable oils, herbs, crab, fruit, seeds.